Welcome to my blog on the Comerford Family History, looking at the history of the Comerford family in Ireland, especially in Co Kilkenny, Co Wexford and Dublin, and the history of the Quemerford family in Wiltshire and the Comberford family in Staffordshire. The essays on this blog are divided into three parts. The first part looks at the Comerford families of Ireland. There is an introduction to genealogy and the Comerford family. I then go on to trace the origins of the Comerford family in Quemerford, near Calne, Wiltshire, and trace the main branches of the family in Callan, Ballybur, Danganmore, Ballymack, Callan and Castleinch, in Co Kilkenny, Bunclody (Newtownbarry), Clohamon and Templeshanbo, in Co Wexford (with some diversions to Argentina and to Illinois in the United States) and their descendants in Dublin, Horetown, Newbawn and Fethard, Co Wexford, and Wexford Town, and the Comerfords of Rathdrum, Co Wicklow, who had strong connections with north Co Wexford. In addition, there are shorter essays on other branches of the Comerford family that may have roots in Co Kilkenny or Co Wexford, including Comerfords who lived in Cork, Dundalk, Hampshire, Somerset and Skerries. The appendices include a critique of the bizarre pedigree registered by Joseph Comerford in 1725, claiming descnt from the Comberfords of Staffordshire for the Comerfords of Ireland. Because of the lasting tradition that the Comerfords of Ireland were descended from the Comberford family from Comberford, between Lichfield and Tamworth, Part 3 is a collection of historical essays on the Comberford family, its various branches and their homes, houses and heraldry. Follow the links below and return to this welcome page to find new essays and chapters, or use the index to essays on the index bar on the left of this page to find your way through the blog. Please excuse some of the formatting, but careful downloading will allow you as the reader to reformat these essays and work your way through these family stories generation-by-generation. In compliance with legislation on data protection, no personal details are given of living people unless they have given me their express permission. I have tried to give full documentation and references for every detail in each essay. In some instances, these references are missing. But this is a work in progress that first began in 1969-1970, when I started collecting family information in Bunclody, Wexford, Kilkenny, Lichfield and Tamworth. And I warmly welcome comments, corrections, additions, updates and new sources and ideas. I plan to update these essays over time, and to add essays on various aspects of our shared story. For example, in April 2012, I completely overhauled the essay on the Comerfords of Ballybur, adding new family information and new photographs. After a visit to Quemerford in Wiltshire in July 2009, I added some new details and some additional photographs to the introductory essay, 2: Quemerford and Comerford family origins . ● An extensive account of the history of the Beaumont families, who brought considerable wealth to the Comberford family of Tamworth: Comberford Appendix 1: The Beaumont family of Wednesbury, added in June 2013. ● a critique of Joseph Comerford’s bizarre pedigree. ● a photograph of Francis Law, born in Dublin in 1829, added in January 2015. ● an archival photograph of Desart Court, built by the Cuffe family on the site of Castleinch, Co Kilkenny, added in December 2014. ● photographs from Bunclody, Kilmyshall, Templeshanbo and Wexford in April 2010. ● photographs from Rathmines and Terenure in Dublin, in May 2010. ● photographs from Lichfield, Staffordshire, in July 2010, March and August 2011, and July 2012. ● new photographs from Fethard-on-Sea and Bunclody, Co Wexford, from Coolgreany, Co Kilkenny, from Athlone, from Tamworth, Staffordshire, and from Quemerford, Wiltshire, in February and March 2011, and from Kells, Co Kilkenny, The Rower, Co Kilkenny, and Monasterevin, Co Kildare, added in April 2012. ● Photographs of Máire Comerford in August 2010 and January 2016, a photograph of her nephew Joe Comerford in 2016, and photographs from Courtown, Co Wexford, in January 2012. ● a profile of the Cork-born actor Chris Comerford. ● a collection of profiles in December 2010 of emminent Comerford surgeons, Comerford war dead, and some Comerford missionaries. ● a profile of the late Dr Joe Comerford. ● a profile of Marie Comerford, mother of the Warrington bomb victim Johnathan Ball, who died of a broken heart in 2009, added in September 2011. ● photographs of members of the Comerford family of Rathdrum, Co Wicklow, added in November 2011. ● more photographs and biographical information about Comerford missionaries, added in November and December 2011. ● more photographs and biographical and genealogical information about the Langton family, direct descendants and heirs of the Comerford family of Danganmore, Co Kilkenny, added in January 2012. ● more details on the Comerford family of Urlingford, Co Kilkenny, and Galway, added in February 2012. ● photographs of the ruins of Danganmore Castle, Co Kilkenny, a photograph of the ruined churchyard in Danganmore, a photograph of the gates of Borris House, Co Carlow, photographs from Ballinakill, Co Laois, and a photograph from an archaeological dig in Wednesbury, in April 2012. ● more biographical details of Bishop Michael Comerford, including his role in building the parish church in Monasterevin, Co Kildare, and his friendship with the poet Gerard Manley Hopkins. ● more photographs from Saint Bride’s Church, Fleet Street,with some additional information on the Revd Edwards Comerford Hawkins, in August 2012. ● more recent photographs from Quemerford and Calne in Wiltshire in August and September 2012. ● more photographs from the Moat House, Tamworth. ● more details about Comerford families in Victorian Dublin, added in July 2013 and June 2014, including a photograph from one of their houses in Kenilworth Square, Rathgar, although I have yet to identify their connections with other branches of the family, and need to format the footnotes. ● more details about Comerford families in Galway and Balbriggan, Co Dublin, including more photographs. ● further details of Dr Joe Comerford, his family background and his education, including a photograph of Fitzwilliam College, Cambridge. ● photographs from Skerries and Balbriggan. 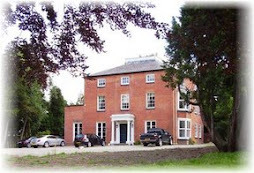 ● further information about previous owners of the Moat House in Tamworth, Staffordshire, and about the opening of Comberford’s Restaurant in the Moat House. ● further information about the Comerford family of Dundalk, Co Louth. ● more information and about Comerford Hall in New South Wales. ● photographs from Bunclody and Templeshanbo, Co Wexford, Ranelagh and Rathmines, Dublin, and Comberford, Staffordshire in April 2011. ● photographs from Westland Row, Redmond’s Hill and Ranelagh in Dublin. ● a photograph from Norbury in Derbyshire, in May 2011, along with old photographs from Mancetter in Warwickshire and Anglure in France. ● a photograph of Judge James Comerford at his last Saint Patrick’s Day Parade in New York in 1988. ● a photograph of Father James Comerford OMI. ● a photograph of the Irish film-maker Joe Comerford. ● photographs from Saint Canice’s Cathedral, Kilkenny, Ballybur Castle, Danganmore Castle, Coolgreany House in Co Kilkenny, the Hole in the Wall, Kilkenny, Saint Mary’s Church, Callan, Kells, Kilree, and The Rower, Co Kilkenny, from Saint Stephen’s Green, Dublin, and from Pipe Hall, near Lichfield. 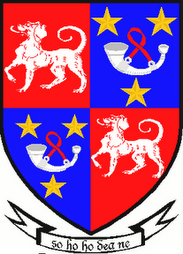 ● details of the Comerford Greene family of Cork and Dublin. ● In September 2010, I added details of the extraordinary story of Mary Comerford, Countess de Créquy, who was born in Athy, Co Kildare. She is said to have poisoned her husband in France shortly before the French Revolution, escaped to England, and lived for another ten years as an aristocratic widow in London, where she had an amazing pedigree drawn up for her in the College of Arms, claiming descent from the Comberford family of Comberford in Staffordshire. ● More information on the Comerfords of Bunclody and Dublin, added in November 2010. ● Further details on the Comerford families of Skerries, Co Dublin, and their descendants, added in February 2015. ● A profile of the Cork-born actor Paddy Comerford, following his death in November 2010. ● A profile of Pierce Comerford of Coolgreany House, Co Kilkenny, added in March 2011. ● additional information on the descendants of the Comerford family in Skerries, Co Dublin, added in March 2011. ● further information on the Comerfords of Galway. ● further details on Comerford Law family of Killaloe and their descendants in England and the US, including three recently found photographs, and the descent of the English actor and playwright Arthur Law (January 2013). ● information and illustrations about the Comerford bookshop in Portsmouth in the mid-19th century. ● an old photograph of Wednesbury Manor, added in April 2011. ● further information on the Comerford-Green family of Leeson Street, Dublin, updated in May 2011, March 2012 and February 2013. ● Photographs of James Comerford’s pub in Mooncoin, Co Kilkenny, March 2013. ● A photograph from Kilcash Churchyard, Co Tipperary. ● Photographs from Callan, Co Kilkenny, and from Florence in April 2013. ● In June 2011, I rewrote the story of the Comerford families in Argentina and added new photographs of their descendants. ● In July 2011, I added additional photographs from Bedford Square, London, Carlow Cathedral and Bagenalstown, Co Carlow. ● In August 2011, I added additional photographs from Lichfield. ● In September 2011, I added a profile of James Comerford, 2nd Duke of Ormond, who occasionally used the name Comerfort during his time as a Jacobite exile in France in the early 18th century. ● In October 2011, I added further genealogical details on the Comerfords of Cork, including biographical details of Mary (Comerford) Boddington, the Cork-born Victorian poet, and a photograph of the former Newcomen Bank in Dublin. ● In November 2011, I added a photograph of Father Pierce Michael Comerford, a 19th century missionary from Kilkenny who worked in Berkeley, California. ● Updated photographs from Lichfield in May 2012. ● More images of portraits by the miniaturist John Comerford. ● Details of the letting of Quemerford House, which was on the market in July 2012 for £2,500 a month. ● In July and August 2012, updated details, including descriptions, floor plans and new photographs, of Comberford Hall, which was on the market with offers being invited in the region of £950,000. ● In May 2013, I added photographs of a portrait of Basil Brooke, who was a child when he inherited the Madeley estate in Shropshire from his father, Captain Comberford Brooke. Basil was aged 19 and still a minor when he died in 1727. The photographs come courtesy of Paul and Kathy Schaefer, Fairfield, Iowa, who inherited the portrait. ● In November 2013, I added a photograph of William Fenton Peel, who was living at Comberford Hall when my great-grandfather visitied in the early 1900s. ● In February 2014, I updated the page on the Moat House, Tamworth, with reports of its impending sale. ● In February 2014, I updated the page on Comberford Hall, correcting some genealogical details about the family of William Fenton Peel. ● In March 2014, I updated the page on Comberford Hall, adding three portraits of people who had lived there in the past: Arthur Chichester (1739-1799), 1st Marquess of Donegall; his son, Lord Spencer Stanley Chichester; and Richard Howard (1733-1819), who became the proprietor of Comberford Hall in 1808. ● In April 2014, I added a Victorian print of Oxley, where a branch of the Comberford family lived briefly in the early 17th century. ● In June 2014, I added a photograph of the Ancient High House in Stafford, where Colonel William Comberford briefly had his headquarters during the English Civil War in the 17th century. ● In August 2014, I added biographical details of the Revd Philip Comerford (died 2006), who was born in Dublin and spent much of his life as a missionary in Paraguay and as an Anglican priest in Canada. ● In September 2014, I added a new biography of Major James Comerford, who commanded the Dublin Fire Brigade during World War II. ● In April 2015, I added a new biography of Charles Blake-Forster (1851-1874), genealogist and heir to the Comerford family of Co Galway. ● In November 2015, I added more details about the Comerford families in Galway and their descendants in Australia, and a photograph of the Danganmore Wayside Cross by Liam O’Sullivan of Kells, Co Kilkenny. ● In July 2016, I added a new posting on Comberford village today, with photographs. 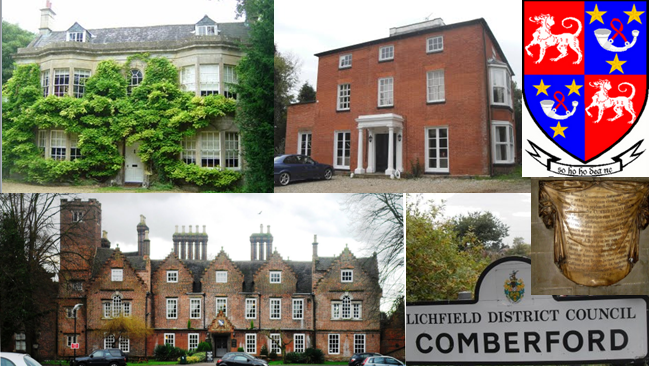 ● In July 2016, I updated the details of the ownership of the Moat House and added new photographs of the Moat House and other buildings in Lichfield Street, Tamworth. ● In May 2017, I added an image from the Down Survey naming Comerford family lands in Co Kilkenny as Comberford’s Grange. I hope this collection of essays helps all who are interested in the history of the Comerford and the Comberford family, the history of Co Wexford, Co Kilkenny, Lichfield and Tamworth, and especially members of my own (extended and long-tailed) family. Gill Jones, formerly of The Close, Lichfield, Johann Popp, formerly of Saint John’s House, Lichfield, Pauline Duval of Dam Street, Lichfield, Ruth McLaren and the staff of the Moat House, Tamworth, and all at the George, Lichfield, the Hedgehog, Lichfield, the White Hart, Calne, and the Talbot, Quemerford, for their warm welcome and hospitality. Clive Daggett, Hawley Cricket Club Treasurer and Researcher, for information about William Felton Peel and his family, who lived at Comberford Hall (1900-1902) where he was visited by James Comerford. 13: The Comberford Family in Lichfield. 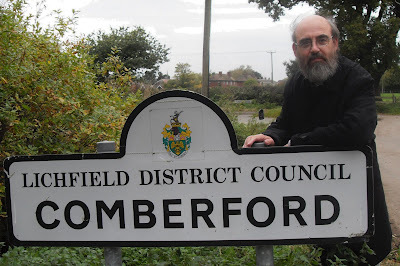 I am a member of The Guild of One-Name Studies, and the following one-name studies have been registered with the guild: Comerford, Comberford, Commerford, Quemerford and Comerton. Last up-dated: 29 June 2018, 7 July 2018. My maiden name was Helen Comerford. My father was born in Dublin, but died 20years ago aged 56yrs. I am very interested in the Comerford History as I have no connections at all with my Irish Family at present. If you'd like to contact me drectly I'd be happy to help you if you either email me or telephone. My email address and my telephone contacts are available on my Facebook page. COMERFORD Edmond, 21, arrived Sydney on the Blairgowrie 1881, Labourer, Kilkenny, parents Michael & Anastasia, Kilkenny. Cousin Mrs Casey, Sydney no other detail for males. Edmond Comerford was my great grandfather. I found the above and it's intersting that they arrived in Sydney but went to Melbourne soon after. I'm somewhat interested about their Kilkenny background and I'll study this site some more. Yes your website was full of sound information - I know the surname is rare and most people who do have it will be from Ireland - Myself my grandfather arrived from Cork sometime before the first world war and settled and married a local lass from manchester and the rest is history. Congrats on the wed page to our name. It is nice to see that there is a picture of our house in the photo section... the shop fromnt with the frowers in front, near castlecomer, co kilkenny. My grandmother was Caroline Flowerday. I have her death certifucate somewhere, I'll find the details for you as she died in 1959 not 1951. She and Henry Herbert had nine children and my dad was the baby of the family. I came upon your blog by accident and will read your research with great interest as I know nothing about Caroline's family. I enjoyed reading your website. My gr gr grandfather was Thomas Comerford b abt 1837 in Templemore Tipperary. He and his brother Denis (b.abt.1834) came to Australia in 1862 and settled around the Clarence River in New South Wales. Their death certificates state their father's name as William Comerford and mother's name as Mary Talbot/Turbit (writing is hard to read). I have never found much information at all about Comerfords from this area...do these names ring a bell at all to you?? I would dearly love to find some siblings for history for this branch. Great site. I've recently started looking for information on our ancestors, in particular, the Comerford connection. My great-great grandmother, Jane Comerford of Miltown Malbray Co Clare married James O'Flaherty of Lettermullen around the 1860's, I'm guessing. She was born around 1840-1841. She had two brothers Henry & George who became doctors, one of them working around Harley St, London(or so we believe).I would love to know the relationship, if any, with Henry Comerford as mentioned on your site and know the subsequent whereabouts of Henry & George. As her birth & possibly her marriage are before records started in Ireland, I'm struggling. Have you any details on children & nephews/nieces if Henry Comerford. How might one reach you? My wife and I will be in Dublin the last week in October and I would very much appreciate the opportunity to meet you. I am originally from Boston and over the years have had the opportunity to get to know both Judge Jim Comerford of New York and the late Barney Comerford of Portland. When I ran for the U.S. Congress in 1992, I received a number of contributions from other Comerford's, including Dr, John Comerford of New York State. I tried to find you on FaceBook but your site was unavailable. My e-mail address is jpc@jpclife.com. Just like to say that this probably the best website on the internet. What a wonderful site! I have just dipped my toe into some family research and now appreciate the work involved! My great-great-grandmother was Anne Comerford. She had twin boys John and Thomas whose baptisms were registered in Booterstown parish in April 1865. One of the boys' sponsors is listed as Thomas Comerford.The father is named as John Connor although I can find no record of a marriage cert between John Connor and Anne Comerford. Would you have any information on Anne Comerford? What a treasure of information! My mother's maiden name is Comeford. Apparently when her ancestors came to America, the ones writing down the names of the people coming off the boat dropped the 'r' in their name - hence the modified name. My mother always talked about wanting to visit Balybur castle, since she had always heard of 'the family castle' in Ireland. I can't wait to show her this blog! Great to read your postings. John Buggy (Mayor of Kilkenny in the 1860's/70's)was my great grandfather. As you know, his wife was a Rourke-Madden-Comerford! One of my great great great grandmothers was Jane Comerford, daughter of James. She married Edmund Madden in 1781. Their daughter Ellen married an O'Rourke about 1800 and Eliza my great grandmother was their daughter. Also enjoyed your posting about the double doors. The offices of Michael Buggy, solicitors, was opened by my great uncle Michael J Buggy for business in the 1880's. As you know, after 4 generations this business has sadly now come to a close. In fact the old engraved sash windows are for auction this month in the local art sales auction house! My name is Paschal Comerford, originally from Carrick on Suir, Co Tipperary, descended from Thomas Comerford, b1880 of Scarwalsh, Wexford (Gurteen Comerfords). I’ve just come across your blog in the last few days, and it makes amazing reading. Its fantastic that you’ve managed to unearth so much information. Well done. I’m actually now living in Rathfarnham, Dublin, and it would be nice to maybe meet up sometime, and I can try to fill in some gaps. My dad's mother was a Comerford and we've been filling in quite a bit of the Comerford family tree for our branch here in Liverpool, descended from James Comerford who was born in Ireland around 1831 (we believe his dad was Patrick Comerford). He allegedly met his wife, Ann Hanlon, on the cattle boat over from Ireland and got married pretty soon after arriving in Liverpool (July 1st 1863 - we have the wedding certificate if anyone wants a copy. Anyone interested in linking family trees together can contact my Dad at bill_barnes AT mail2bill DOT com - we are also working on putting it online at Geni.com and MyHeritage.com). I've already seen a couple of people on here amongst the extended family, so I'll drop a note in adding what I can where I can. I've recently become a Comerford by marriage and I must admit this blog is partly responsible for my taking my husbands name as before I stumbled accross this I was all for keeping my maiden name! My husbands' grandfather was Michael Comerford, he moved from Limerick to Liverpool we believe some time after or during the War. Thank you for the interesting reads, Patrick. I came across your site while researching family. I'm not directly related, but my grandmother, Mary Cooney Flaherty McKenna, was the second wife of Joseph F. Flaherty, whose first wife was Elizabeth Flaherty, daughter of James O'Flaherty and Jane Comerford. I noticed that one of your followers had mentioned the desire to find some family info. I have found that Joseph & Lizzie had 5 children, the youngest, Elizabeth, was an older step-sister to my father. The painting was hanging in the home of Kay Birkby, Kathy's mother, of Fond Du Lac Wisconsin, who recently passed, rest her soul. The painting is about 12" by 9". I am happy to send you a jpeg. We are curious to explore our relationship with these ancestors and can be reached at satyuga2@gmail.com. Hi, A very interesting site. Hope this adds to your great site. Hi there, great blog. I came across it because my Father is attempting to find his biological Father. He has no record of his name but he believes the surname is Comerford. If so it would be in the Kildare area. He also said that he believed his paternal Grandmother was a writer perhaps for the BBC. My father was born in 1959 before leaving Ireland to Wales and eventually settling in England. Any information on any Comerfords who may have written for the BBC (supposedly for a radio show) would be helpful. I'm exploring a family line that has led me to Peter Comerford (Americanized as Comaford) who was born in abt. 1797 in Ireland and who emigrated sometime between his birth and his marriage to an American woman, Mary (Polly) Lewis, in abt. 1833. I came across your site in searching for additional information on Peter. I've searched all your potentially relevant pages and found nothing. I understand Ireland did not keep emigration records, and I have found no US immigration records except the one mentioned in this blog to Illinois in 1888. I suppose my next move would be to visit the Family History Library in Salt Lake, where they may have additional as-yet-to-be-indexed US immigration records, but if you happen to come across anything in your research, I would be forever grateful if you would pass it along. Thank you for posting so much interesting family information. My great grandmother, Margaret Comerford, emigrated to the United States as a child in the late 19th century. She married Jack Egan, parents of my paternal grandfather, James Francis Egan, who brought the family to San Francisco, California. Some years ago, a cousin Barney Comerford (US) collaborated with Thomas Comerford (Ireland) on a history of the Comerford family back to 1063. This publication is in the collection of the American-Irish Historical Society Library, Fifth Avenue, New York. When I last visited Dublin, I took the train to Kilkenny where I met many kind people who welcomed a middle-aged American. It's a small world! Barney Comerford was a distant cousin of mine. While doing research at the American-Irish Historical Society Library in New York, I came across the Comerford Family History that he co-authored with another cousin, Thomas Comerford in Ireland. The history includes charts, photos, and biographies back to 1063. My great grandmother, Margaret Comerford, came to the US in the late 19th century. She married Jack Egan; my paternal grandfather James Francis Egan was their son. Hello Patrick. My name is Ron Comerford, and I have really enjoyed your blog. My wife Donna (since May, 1985) and I will be traveling to tour Ireland 9/22/17 thru 10/2/17. We plan to be in Dublin for 3-4 days. Our tour will take us South to Graiguenamanagh, Co. Kilkenny, home of my Great, Great Grandfather Edmond (Edmund), married to Anty Keating in 1850. Great Grandfather is Phillip Bernard b 1858, married to Marry Sullivan. Grand Father James Thomas born 1907, Maried to Mary Thoman, in Gary Indiana, (both deceased) Father, William Bernard married to Marybeth both living North of Milwakee WI (Menasha). I have a genealogy map I would like to share, and will be looking you up on Facebook. If schedules permit, it would be a great honor to meet you in Dublin! Does anybody come across the name Cumisky/Comiskey in their travels when looking at Comerford? Thanks for the great info Patrick, we are just looking into the Irish version of our name and our info seems to suggest it is Comartun (with 'u' fada). Do you known if this is the correct version for Waterford descendant from Callan Kilkenny? Or was there ever a true Irish version for this line. We also understand comiskey is more northern form that is used as you have said and not correct for South East comerfords. Thanks for you help and looking forward to diving deeper into your blog. Hi Suzanne- My great great great grandfather was Peter Comerford and he was “supposedly” born on 12th October 1809 at St. Canice’s in Kilkenny. Due to due to the similarities in names I have came across numerous documents pertaining to your Peter Comaford. Email me at mj_comerford@yahoo.com if you would like me to point you to additional resources. For starters, look into records originating in Vermont U.S.